Clarence William "Bill" Nelson II (born September 29, 1942) is an American politician and a member of the Democratic Party. 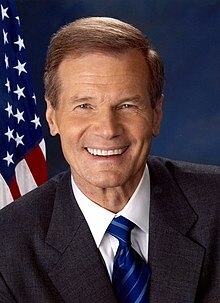 He was the United States Senator from Florida from 2001 to 2019. Nelson was born in Miami, Florida. He was raised in Melbourne, Florida. Nelson studied at the University of Florida, Yale University and at the University of Virginia. Nelson began his career in the Florida House of Representatives, where he served from 1973 to 1979. He then served in the United States House of Representatives from 1979 to 1991. In January 1986, Nelson became the second sitting member of the United States Congress to fly in space along with John Glenn. He flew as a Payload Specialist on the Space Shuttle Columbia. He served in the United States Senate, serving Florida since 2001 to 2019. In 1972, Nelson married Grace Cavert. The couple have two adult children: Charles William "Bill Jr." Nelson, and Nan Ellen Nelson. He has suffered from prostate cancer. ↑ "Florida Marriage Collection, 1822–1875 and 1927–2001". Ancestry.com. ↑ Henry Pierson Curtis and April Hunt (November 9, 2006). "Senator's Son Arrested after Orlando Fracas". Orlando Sentinel. ↑ "Florida's senior senator praises Martinez, stays quiet about possible candidates in 2010". U.S. Senator Bill Nelson – Florida (official U.S. Senate website). Retrieved 2009-12-16. This page was last changed on 23 February 2019, at 15:59.